WebRTC allows P2P communication between Web browsers. It has been attracting an interest in recent years and is beginning to be used in a wide range of fields. Progress in Internet technology is expected to diversify the means of communication between enterprises and customers from simple telephone calls and email to include easier and more convenient means, such as video calls and Web chats. We have developed an experimental application system that uses WebRTC to integrate a variety of task-specific communication tools, such as telephones, at a contact center with the aim of improving work efficiency there. Main functions implemented in this system include audio/video communication that involves an agreement procedure, setting up of FIFO-based inquiry channels, and visualization of access line congestion state. We have created test scenarios that simulated contact center tasks. Using these scenarios, we compared the experimental system and an existing system in terms of the response time, the degree of functional integration of tools, and usability, which is based on a system usability scale (SUS). In recent years, there has been an interest in WebRTC (Web Real-Time Communication), a technology that allows a P2P (peer-to-peer) connection to be set up between Web browsers . WebRTC has been released by Google as open source software. The World Wide Web Consortium (W3C) has standardized a WebRTC API for browsers  and the Internet Engineering Task Force (IETF) has standardized a related communication protocol . WebRTC makes it possible to replace video chats between terminals implemented via servers using dedicated application programs with P2P connections between Web browsers. This new form of communication is expected to be used for a variety of purposes in the industry. An example of a system that uses WebRTC is a browser-based system that remotely supports elderly people unaccustomed to the Internet in conducting electronic commerce (EC) . The Web browsers of the inexperienced EC customer and the supporter exchange URLs and screen shots using WebRTC-enabled P2P communication so that they display the same image. The video captured by a camera and the voice picked up by a microphone on each side are also exchanged using P2P communication so that the supporter can recognize whom the other side is communicating with and can provide detailed support information using audio and video communication. In addition, using HTML5 Canvas, the supporter can draw an image that indicates which part of the browser screen the customer should pay attention to. This drawing is synchronized on the customer’s browser. In this way, the supporter can assist the EC customer effectively. Although progress in Internet technology in recent years has been changing the way consumers communicate with each other, there have not been significant changes in the way consumers communicate with enterprises. Existing contact centers typically communicate with customers using phone calls and email. PCs are used for sending email. PCs are also used for recoding logs of interactions with customers besides sending emails and visiting Web sites. There is a demand for simplifying these tasks and improving work efficiency by integrating various uses of PCs. In addition, now that the widespread use of smartphones and SNSs has made digital communication the main mode of communication, particularly for younger consumers, it is desirable that diverse means of communication can be used for interactions with customers. This paper proposes a WebRTC-based application system that integrates a variety of communication channels, including telephony, used at a contact center in order to improve work efficiency there. Section 2 describes tasks performed at a contact center and related studies. Section 3 presents our proposed application system and issues that must be addressed to implement the system. Section 4 proposes solutions to these issues. Section 5 describes an experimental system that implements the proposed application. Section 6 presents the method used to evaluate the proposed system. Section 7 reports on evaluation results. Section 8 summarizes this paper and presents future issues. This section describes the current trend in contact center tasks, and WebRTC technology, which is central to the application proposed in this paper. Although progress in Internet technology in recent years has been changing the way consumers communicate with each other, there have not been significant changes in the way consumers communicate with enterprises. The main means of communication used for the latter are still telephony (86.1%), Web sites (79.8%) and email (51.0%) . However, there is a demand for using digital means for communication with enterprises, such as Web chats (degree of expectation: 36.9%) and video calls (43.1%). This demand comes, in particular, from younger consumers, who are accustomed to digital communication thanks to their use of smartphones and SNSs . While expectation for using the conventional means, such as telephony, Web sites and email, is lower, it is still significant. Therefore, enterprises are required to handle a wide variety of communication means . Since younger Internet users are already using various types of applications, they are more or less accustomed to operations of Internet applications. However, in cases where the user is interacting with a single person, such as an operator at a contact center, it is confusing and troublesome to launch a number of applications and tools and to set the email address of the person with whom he or she is communicating. It is necessary to solve this problem by integrating these communication channels to a contact center and providing a unified user interface (UI), thereby eliminating the need to perform complicated operations on individual applications and tools. WebRTC is an open framework that makes interactive and real-time communication possible using UDP/IP on a Web browser without requiring any plugin to be added to the browser . WebRTC is supported by three Web browsers: Chrome, Firefox, and Opera. However, WebRTC may not always work even on these browsers depending on the OS used. For example, it does not work on Chrome running on iOS. WebRTC makes possible P2P communication of stream data captured by the camera/microphone of a terminal, text data and binary data [7, 8]. It is necessary to design a user interface (UI) for telephony functions at a contact center, such as call transfer, call holding, and dialing to a specific customer. This UI design must be implemented on the proposed application system. In a call center, a private branch exchange (PBX) is used to enable multiple lines to be accessed with a single phone number. This ability must be implemented on the proposed application system. It is necessary to keep logs of tasks performed. Such logs may be used as evidence when dealing with complaints from customers, or as a data mining resource for improving quality of service. WebRTC ensures data confidentiality because it allows P2P communication of data to take place without passing through any server. Data are stored only in the client terminal unless deliberately designed otherwise. To keep logs, it is necessary to implement an ability to select data appropriate for the logs from among data exchanged using P2P communication and to store them in a database server. 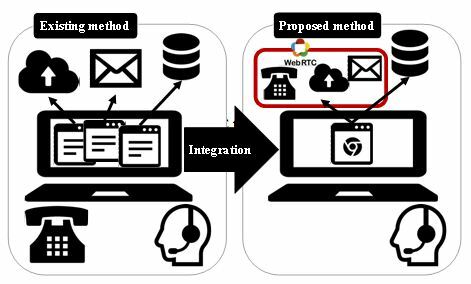 This section proposes an application system that uses WebRTC to integrate communication channels at a contact center in order to improve work efficiency. Specifically, as shown in Fig. 1, various communication functions at a call center, such as making phone calls, exchanging text data using email and clouds, file sharing, logging of interaction history, which is normally performed using a dedicated tool, are integrated into a single application system. It is necessary to address the following issues to implement this integration. We need to identify required functions related to communication channels used at a contact center, and to develop a use case for the experimental application system to be implemented. We will select an API for implementing WebRTC, a development language and a development environment, and develop an experimental application system in accordance with the functional requirements identified above. An application system that serves as a contact point with customers must satisfy a certain level of usability. We will design the experimental application system in such a way as to enhance its usability. be able to check the number of customers in the waiting list and their sequences of arrival constantly. be able to initiate sending of a request for permission to communicate with a customer by clicking his/her name in a list. be able to transfer calls between operators (and operators alone) and to make multi-party calls. (a) be able to check the number of customers in the waiting list and their sequences of arrival constantly. (b) input his/her name, email address, and phone number when accessing a contact center. (c) cannot initiate a call to an operator but wait for a call from an operator. 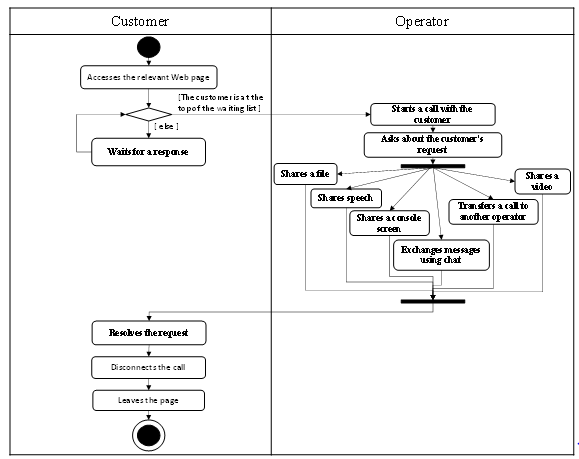 (d) do not start communication with an operator before explicitly agreeing to communicate in response to a communication request from the operator. The application system needs to accept inquiries from customers by telephone. For this purpose, two different Web pages are provided: one accessed by the customer when making an inquiry and the other accessed by the operator when responding to a customer. 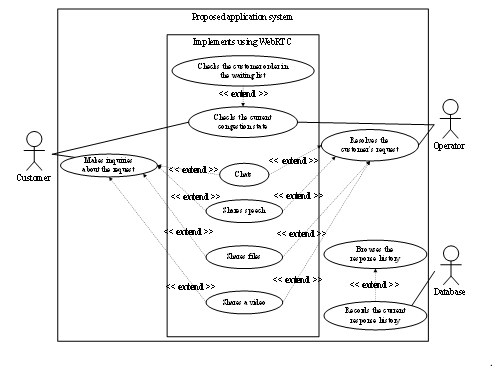 The basic flow of this application system is shown as an activity diagram in Fig. 2.First, the customer accesses the URL for inquiries, and waits for a response from an operator. The operator, who has already accessed a dedicated URL, starts communication with the customer located at the top of the waiting list and uses one of the communication channels provided by the application system to respond to the customer’s request. When the request has been resolved, the customer disconnects the call and leaves the Web page. This completes the response flow for one customer. Conventionally, different tools are required to handle different tasks, such as exchanging text/file data and sharing screen images. The proposed application system can handle all the tasks. This section identifies the requirements for handling communication channels. The following functions are required to handle the tasks identified in Sec. 4.1. Before the operator starts WebRTC-based MediaConnection with the customer, he/she needs to check that the customer agrees to that communication. This is done as follows. The operator clicks a customer name in the customer list assigned to that operator. 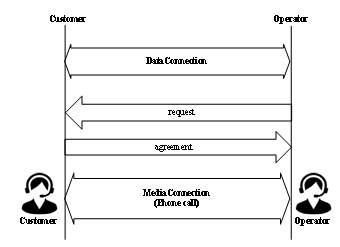 This generates a DataConnection, and a communication request is sent to the customer to check whether the customer agrees to communicate. On receiving this request, the customer client indicates the request using a pop-up window in the application system. When the customer agrees, the two parties begin to talk to each other. 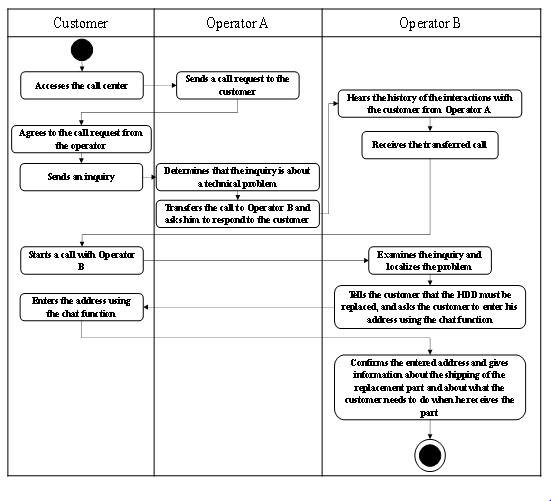 The flow of these interactions between the customer and the operator is shown in Fig. 3. Some functions supplementary to this audio communication are provided to the operator: a three-party call, in which the operator can talk with another operator regardless of whether he/she is in communication with the customer, call holding, and call transfer. In addition, by asking the customer to enter his/her contact information in advance, the operator can re-contact the customer when the telephone connection in use is unexpectedly disconnected. Establishment of inquiry lines is based on FIFO as shown in Fig. 4. The customers are listed in the order in which they accessed the contact center. Operators respond to customers in the order on this list. This list is shown in the customer list window and is updated and redrawn on the window when a new customer accesses the center, when any customer in the list experiences a change in communication status, and when any customer in the list leaves the application system. Since customers can see the customer list, they can check how congested inquiry lines are. In order to reduce the workload of operators, a UI is provided to record operation logs either automatically or in an easy-to-use manner. There are two types of log: an activity history log, which records timestamps of call initiation and end, and a data history log, which records text data generated by speech recognition. The operator should be able to send character strings to the customer while speaking with that customer so that the customer can easily receive information that is difficult to convey verbally. In addition, the operator should be able to send image files and document files so that he/she can share, with the customer, large documents or visual information that are difficult to convey verbally. The operator shares the console screen with the customer so that the customer can easily understand operational instructions given by the operator. The operator can give appropriate instructions because he/she can see operations executed by the customer. The application system provides lines provided by conventional contact centers using a PBX. If a customer finds that his/her access line is busy but does not know how long he/she has to wait before a line becomes available, he/she may become frustrated. A way to reduce such stress is to visually present the congestion state of the center to the customer. 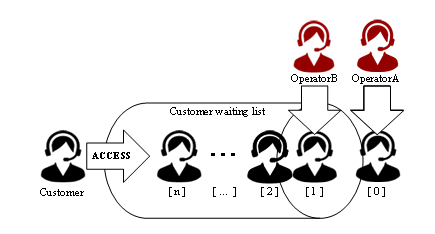 Specifically, the application system discloses the number of customers in the waiting list and the particular customer’s order in the list, as shown in Fig. 5. Operators respond to customers in the order in the waiting list. The customer can see his/her order in the waiting list anytime. A use case of an experimental application system that is equipped with the above-mentioned functions is shown in Fig. 6. The configuration of the experimental application system developed is shown in Fig. 7. 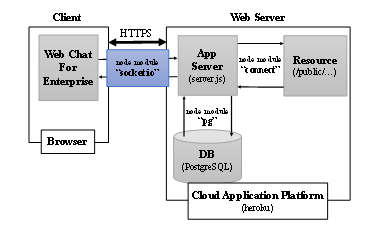 The Web server was implemented on heroku, which is a cloud application platform . The server.js is an application execution file written in Node.js. It manages page resources (HTML/JS/CSS) using a connect or http module, operates as a simple HTTP server, and accesses the database for the operation log using a pg (postgreSQL) module. Main program files in the experimental system are summarized in Table 1. Table 1. Main program files in the experimental system. The HTML file, index.html, is a page for customers, and the HTML file, operator_.html, is a page for operators. 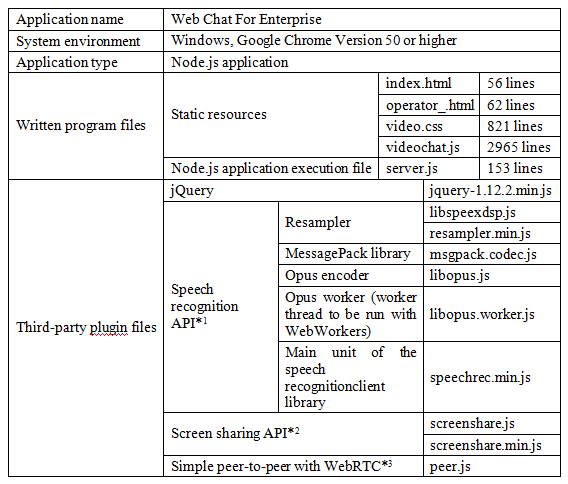 All the processing needed for the operation of the application system is written in one file called videochat.js. All style sheets are put into one file called video.css. Both the index.html file and the operator_.html file read the same script file and the same style sheet file. The videochat.js file checks whether a particular client is accessing the page for the customer or the page for the operator, and operates accordingly. As shown in Table 1, several plugin files provided by SkyWay  are used. SkyWay provides not only an SDK called PeerJS API, which is designed to facilitate implementation of P2P stream data communication and text binary communication using WebRTC, but also APIs for extended functions, such as TURN (traversal using relay around NAT), speech recognition, multi-party connections and screen sharing. In this way, SkyWay makes it easy to implement each function by providing an API for each of them. The overall purpose of this evaluation is to examine whether the experimental application system integrates contact center functions with a high level of practicality. We have evaluated the application system from two aspects: work efficiency achieved by integrating communication channels, and usability. The customer wants to join a research group. He has some questions and wants to know the necessary procedure. Therefore, he contacts the call center. An operator responds and answers his questions. When he asks about the procedure, the operator sends an electronic application form and asks him to fill in the necessary items in the form. 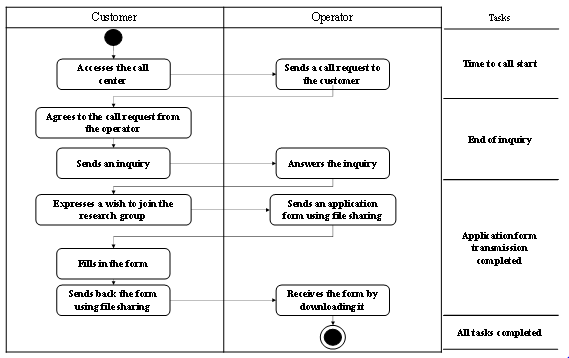 The customer fills in the form right then and there following the instructions given by the operator, and sends back the form. This completes the application procedure. 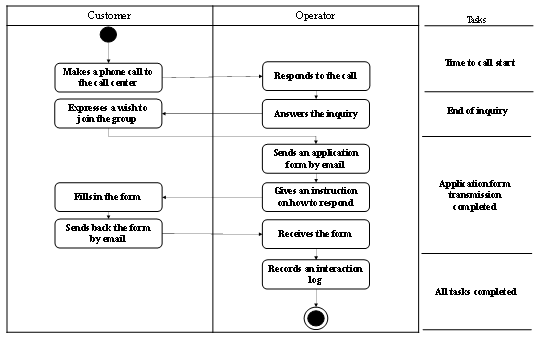 We compared the work efficiency of a conventional call center (Pattern A) and that of a call center that employs the experimental application system (Pattern B). The customer uses a mobile phone and a PC (for Google mail). The flow of tasks in this pattern is shown in Fig. 9. The experimental application system is used. The flow of tasks in this pattern is shown in Fig. 10. The subjects shown in Table 3 executed the two patterns in Scenario 1. The time it took to complete all the tasks in Pattern A and that in Pattern B were compared to see how much work efficiency improved when the interactions between the customer and the operator were switched from Pattern 1 to Pattern 2. In addition, the subjects were asked to respond to a questionnaire survey that focused on usability. Table 3. Subjects in Scenario 1. The customer notices that the lighting states of the LEDs of the server bought from a vendor are unusual, and contacts the maintenance desk to find out what he should do. He first accesses the URL (Web chat for enterprise) of the maintenance desk, and starts a call with Operator A, who is in charge of discovering what the inquiry is about. The customer tells the operator that there is something wrong with the lighting states of the LEDs. Operator A determines that the inquiry is about a technical problem, and holds the call. He calls Operator B and tells him the history of the interactions with the customer. He asks Operator B to take over the inquiry. Operator A transfers the call with the customer to Operator B. After confirming that the call transfer has been completed correctly, Operator A ends the call with Operator B. Operator B starts a call with the customer and asks him to send detailed information about the problem including a video showing the lighting states of the LEDs. The customer takes a video of the lighting states of the LEDs with a camera (this video was an image printed on a sheet of paper in this test), and sends the video. Operator B identifies the fault from the positions of the lit LEDs and explains the fault to the customer. Operator B also gives information about what the customer should do. The flow of tasks in this test scenario is shown in Fig. 11. We measured the usability of the application system. 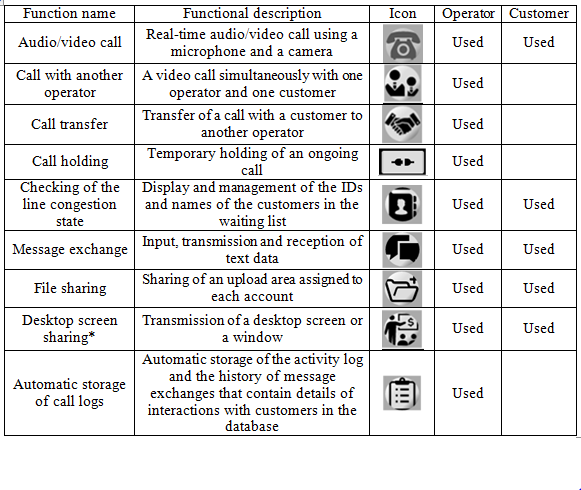 The three subjects shown in Table 4 executed Scenario 2, which involved multiple communication channels. After the test, they responded to a questionnaire survey that focused on usability. Table 4. Subjects in Scenario 2. 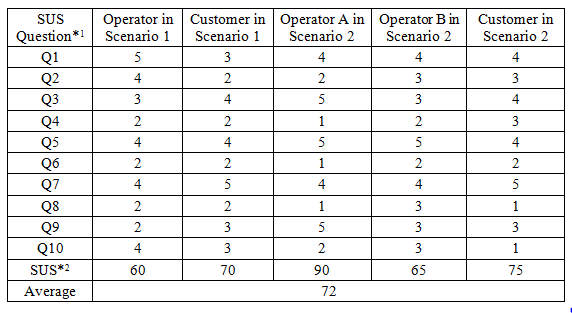 The response time and the number of tools used in Scenario 1, which compared Pattern A (conventional contact center based on telephony and PC) and Pattern B (new contact center using the experimental application system), are shown in Figs. 12 and 13. In Pattern B, the time to call start is long because it takes time to establish P2P communication using WebRTC and because thesubjects were unfamiliar with the operation of the experimental application system. In contrast, in Pattern A, it took only 5 seconds to start a phone call because anyone can do so without thinking. Even with this extra time needed for starting a phone call, Pattern B dramatically reduces the time needed in subsequent steps, resulting in an overall reduction of 43% of the time need for Pattern A.In Pattern A, the step of sending an application form involved simultaneous use of four tools: email, a login tool, a telephone and an application form Excel file. In Pattern B, this step is mostly covered by the experimental application system so that the number of tools involved was only two: use of the experimental application and sharing of an application form Excel file. The number of tools used never exceeds two. This result indicates that the experimental application system greatly enhances work efficiency. The five subjects who participated in Scenarios 1 and 2 responded to a questionnaire survey, which quantifies the level of usability based on SUS (system usability scale) [12, 13]. The average SUS obtained in our test was 72. This value exceeds 68, which is said to be the normal average SUS, indicating that the level of usability of the experimental application system is sufficient. Table 5 shows the score for each question and the calculated SUS . (Note) *1: Questions defined for SUS evaluation. *2:SUS was calculated by applying the score for each questionto the calculation method of Ref. .
We also asked the subjects to answer additional questions Aq1-Aq6 shown below. These questions are based on the usability items defined by Jakob Nielsen . Some answers given by the subjects are shown in Tables 6 to 10. Question Aq1: Did you think that you could operate this application system without reading the relevant manual? If you did or if you were actually able to operate it, specifically which operation do you think you can do? Table 6. Answers to the question related to learnability. Question Aq2: Which did you find more efficient, operation using the experimental application system or operation based on telephony and PC as at conventional call centers? Table 7. Answers to the question related to efficiency. The initial input takes time. It would be better if an autocomplete feature were available so that previously input data are stored and reused. I find it inconvenient that a file cannot be uploaded with a drag and drop operation. It would be easier to track the call state if the relevant log is displayedat the edge of the screen. It is better to make Calling Menu and Other Menu easier to understand. Since there is some space available under the menu, some text, such as “Call completed,” can be added there. It would be better to strengthen associations between the response states and icons. Question Aq3: Do you think that, if you have used this system once, you can use it smoothly the next time? Table 8. Answers to the question related to memorability. Question Aq4: Did any errors or problems occur while you were operating the system? If they did, what were they? Table 9. Answers to the question related to errors. QuestionAq5: While you were operating this system, did you find anything pleasant or interesting? If you did, what was it? Question Aq6: While you were operating this system, did you find anything unpleasant? If you did, what was it? Table 10. Answers to the question related to satisfaction. 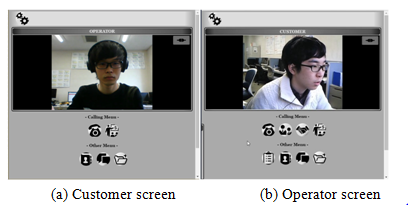 This paper has proposed to use WebRTC to improve use of communication channels at a contact center. We have developed an experimental application system and confirmed that the system sufficiently improves the work efficiency at a contact center. Conventional contact center tasks rely on telephony and PC. This application system uses WebRTC-based real-time video, audio and data connections to integrate contact center tasks. We have confirmed that the system makes it possible to replace use of a telephone with use of a Web browser. This simplifies contact center operations.We have included additional functions, such as file sharing, text chats and screen image sharing, in order to expand the range of tasks to which the system can be applied. This has enabled a single WebRTC-based application system to handle both the essential and supplementary contact center operations. It has been easy to provide services that cannot be achieved with telephony alone. This has not only improved customer satisfaction but also will reduce the operational costs because no telephones are required. We have converted telephone-based interactions with the customer into interactions using WebRTC-based connections. Since we have used UDP-based P2P communication, communications have been unstable many times. One of the future issues is to solve this problem. It is necessary to identify causes of unexpected disconnections, and implement the application system in such a way that, should a communication is disconnected, it will be reestablished immediately. Another issue with our approach is that not all Web browsers support WebRTC. This means that any system that relies on WebRTC cannot serve all customers. It is necessary to promote activities to encourage support for WebRTC by iOS and Internet Explorer. Open Project,“WebRTC,”.[Online]. Available: https://webrtc.org/.%5BAccessed: March 1, 2017]. W3C,“WebRTC 1.0: Real-time Communication Between Browsers,” Working Draft 24 November 2016. [Online]. Available:https://www.w3.org/TR/webrtc/. [Accessed: March 1, 2017]. IETF, “Rtcweb Status Pages, ”Real-Time Communication in WEB-browsers (Active WG). [Online]. Available: https://tools.ietf.org/wg/rtcweb/. [Accessed: March 1, 2017]. N. Hongo, H. Yamamoto and K. Yamazaki, “Development and Evaluation of Browser Synchronization System for EC Refugees Using WebRCT,” The IEICE Transactions, Vol. J97-B No.10, pp. 890-902, 2014. Transcosmosinc., “Investigation on actual situation of communication between consumers and enterprises 2016”. [Online]. Available: http://www.trans-cosmos.co.jp/data/2016dec/. [Accessed: March 1, 2017]. Alan B. Johnston and Diniel C. Burnett,Webrtc: APIs and Rtcweb Protocols of the Html5 Real-Time Web,Digital Codex LLC, 2012. R.Copeland and M. Copeland,“A Question of Quality – VoIP, WebRTC or VoLTE?,”reTHINK project. [Online]. Available: https://rethink-project.eu/publications/conferences-and-journals/. [Accessed:March 1, 2017]. I. Tariq Javed, K. Toumi and N. Crespi, “Browser-to-Browser Authentication and Trust Relationships for WebRTC,” IARIA, The Tenth International Conference on Mobile Ubiquitous Computing, Systems, Services and Technologies (UBICOMM), October 9-13,2016. HEROKU, INC. “Heroku,”. [Online]. Available:https://www.heroku.com/. [Accessed:March 1, 2017]. Node.js Project, “Node.js,”. [Online]. Available:https://nodejs.org/en/. [Accessed: March 1, 2017]. NTT Communications Corporation,“SkyWay,”. [Online]. Available: http://nttcom.github.io/skyway/en/index.html. [Accessed: March 1, 2017]. J. Brooke,“SUS-A quick and dirty usability scale,” In P. W. Jordan, B. Thomas, B. A. Weerdmeester, & A. L. McClelland (Eds. ), Usability Evaluation in Industry. London: Taylor and Francis, pp. 189-194, 1996. [Online]. Available:http://hell.meiert.org/core/pdf/sus.pdf. [Accessed:March 1, 2017]. A. Muddimer, S. Camille Peres and S. McLellan, “The Effect of Experience on SystemUsability Scale Ratings,” Journal of Usability Studies, Vol. 7, Issue 2, pp. 56-67, February 2012. [Online]. Available: http://uxpajournal.org/the-effect-of-experience-on-system-usability-scale-ratings/. [Accessed:March 1, 2017]. Jakob Nielsen, Usability Engineering (Interactive Technologies),Morgan Kaufmann, 1994. Yusuke Shiga is received a bachelor’s degree from Soka University, Japan in March 2017. He was researching on the web service techniques. He joined FFRI, Inc, Japan in 2017. Since April 2017, he has been engaged in development and study of cyber security system. KazumasaTakami is joined Musashino Electrical Communication Laboratories, Nippon Telegraph and Telephone Corporation (NTT), Musashino, Japan in 1979. Since April 2004, he has been a professor in Department of Information Systems Science, Faculty of Science and Engineering, Soka University. He is currently interested in Mobile Ad Hoc Network, Delay/Disruption-Tolerant Network (DTN), Inter-Vehicle Communication Network and Services Software. He is a member of the IEICE, IPSJ, DBSJ, and a senior member of the IEEE.